A man came up behind Heavenly. He was young and blessed with the kind of good looks God gives to the extras in beer commercials. 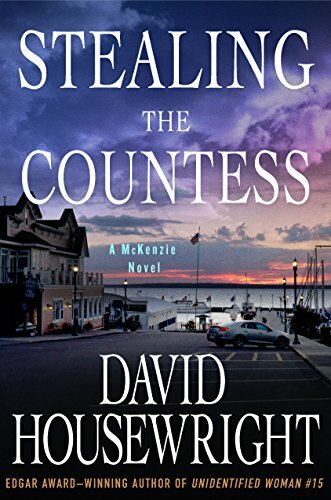 I like David Housewright’s McKenzie novels, and Stealing the Countess is right there in the top two for me, I think. It’s a cool heist mystery. On top of that, it prominently features one of the series’ most interesting continuing characters – a girl with the odd name of Heavenly Petzyk. Heavenly is, we are told, stunningly beautiful, and she takes shameless advantage of her beauty – using it to open doors that would be closed to common people. She describes herself as a “salvage specialist” (shades of Travis McGee), and skirts the borderline between legal and illegal. She’s sometimes been Mac McKenzie’s ally, sometimes his rival. But there’s just enough sadness in the background to allow the reader to like her. Cautiously. “The Countess Borromeo” is a famous Stradivarius violin, currently entrusted to a renowned virtuoso, Paul Duclos, a native of Bayfield, Wisconsin (a town I visited a couple years back). A week ago, Paul gave a concert in his home town, and that night the violin was stolen. The problem is that the insurance company has announced that they won’t pay any ransom for its return. Paul wants Mac to find the thieves and get his beloved violin back – he’ll pay for it himself. The whole thing gets way more complicated than a simple property theft should be, and business, legal, and personal interests put Mac and Heavenly (in temporary alliance) in danger of their lives. I liked Stealing the Countess a whole lot. Highly recommended, with the usual cautions. Previous Post“Few things sting more fiercely”Next PostWould You Travel to a Book Town?